Handling License for Elephants: Worldwide unique & totally amazing! The elephant – the largest land mammal on earth. You get to know it in a way that is seen nowhere else. 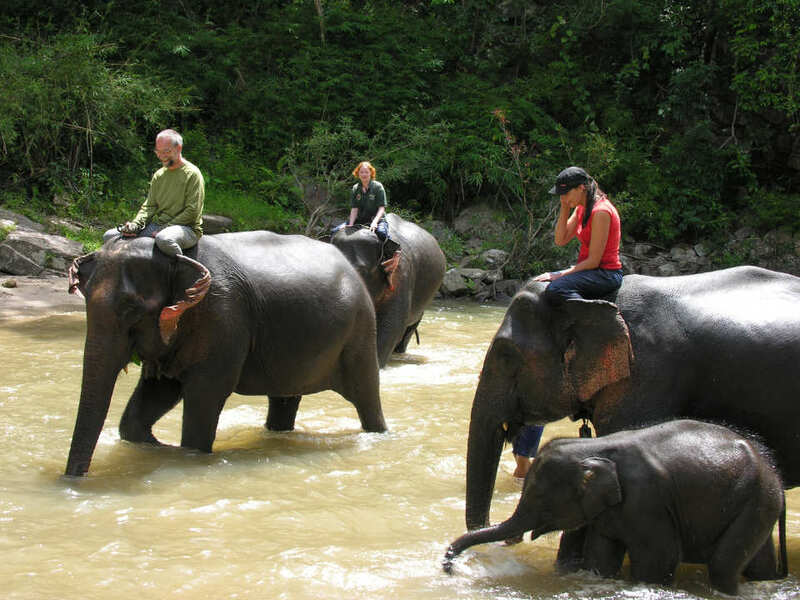 In the mountains of northern Thailand it is our deepest concern not only to introdue you to these wonderful pachyderms. You’ll learn what it means to be so close to the animals that it tingles under the skin. 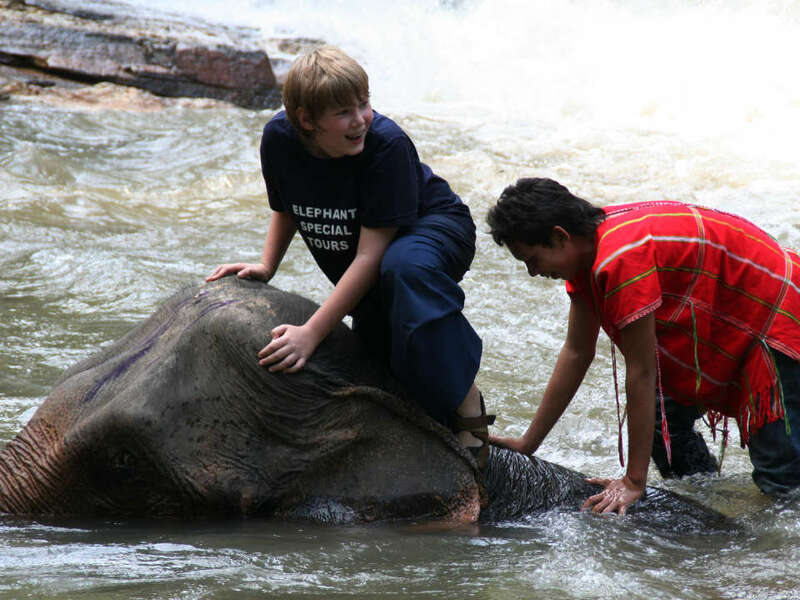 The elephant handling course license handed over to you is at the end of a world-wide tour, which brings you exciting and interesting facts about elephant conservation and Thai culture. On the way to the license you become familiar with “your own” elephant and will learn various commands to control the grey giant. You will spend a lot of time with the elephants and get to know the very special characters of every member of our herd. But it is not just that: To really understand the elephants of Asia it is also important to understand the people that have seen elephants as family members for centuries. Therefore it is of keen concern to us to present the cultural characteristics of Northern Thailand. For this reason, you get a deep insight into life on the ground. 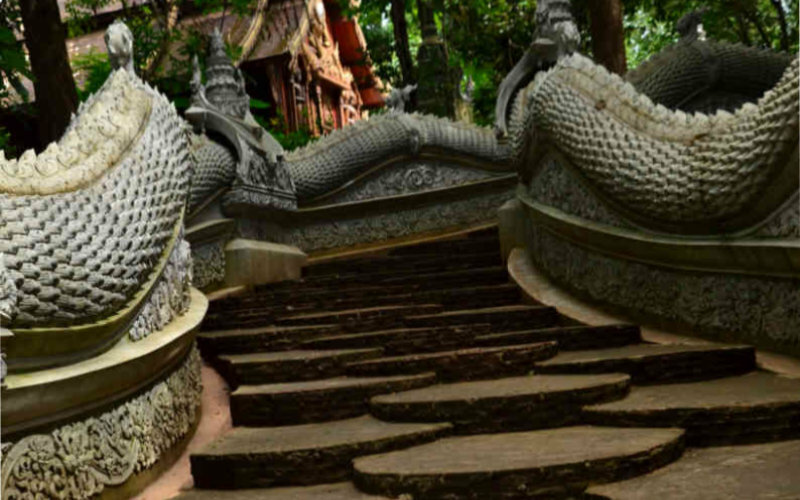 You will experience Buddhist temples – famous as well as those far-off tourist routes. 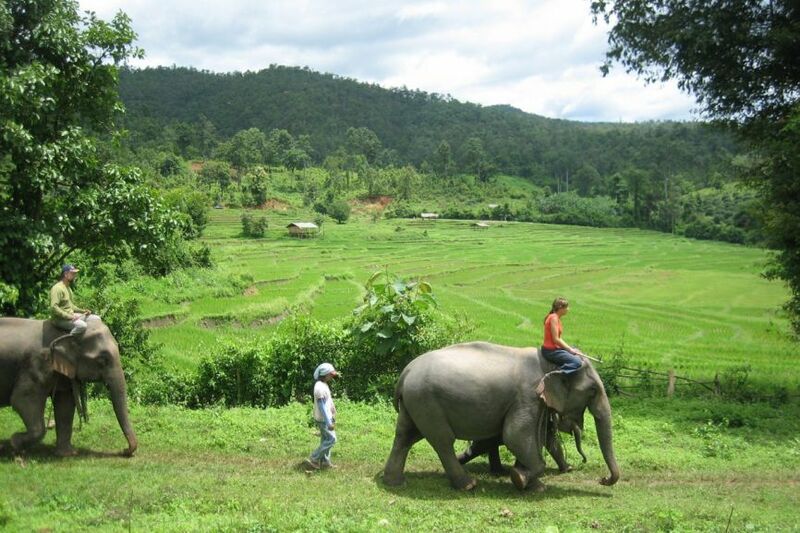 You will get to know the Elephant Conservation Center with its specially arranged elephant hospital. On the other hand, there are hidden waterfalls that can be discovered in this area. Without too much revealing: this tour holds so many surprises for you, that you just have to experience it to believe it. We pick you up at the airport or at your hotel in Chiang Mai and take you to our lodgings in Mae Sapok. In case of arrival before lunch we can arrange a visit to our elephant camp. We introduce you to the life and behavior of elephants. Accompanied by your English-speaking elephant trainer, you will be introduced to our herd and will get to know your “own” elephant in a very calm and intense way. 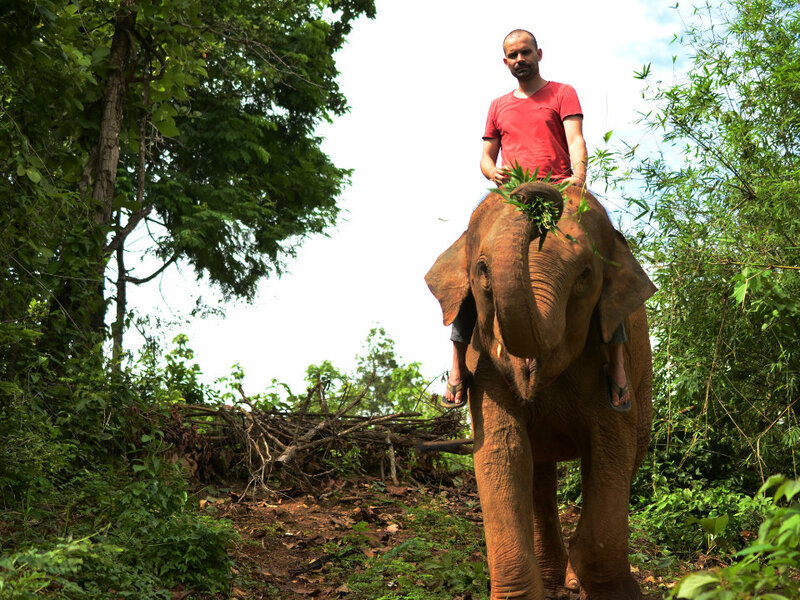 You then will experience your first elephant ride in the neck of your new friend. After lunch in the camp you will take your elephant to a bath in the nearby river and start a ride through the surrounding woods which lets you experience the unique bound between people and elephants for the first time. 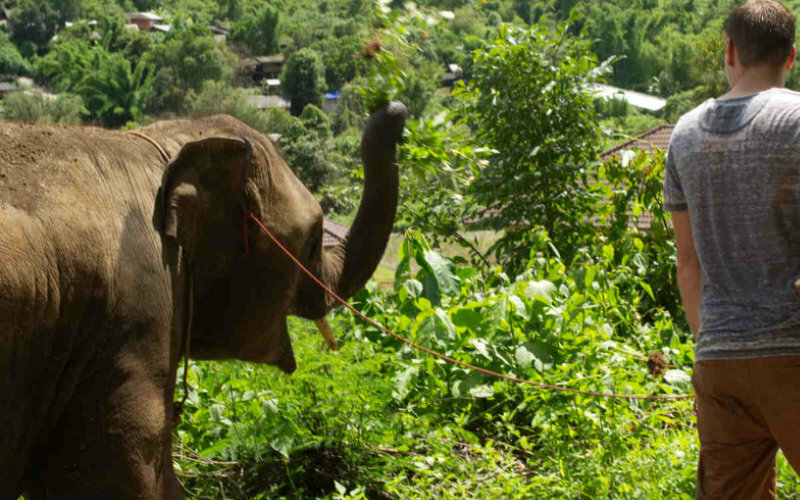 In the afternoon you visit one of the villages of the local mountain people called Karen who work have been working with elephants for centuries. After the multi-course dinner in your lodge you are free to watch a movie about the anatomy of elephants. 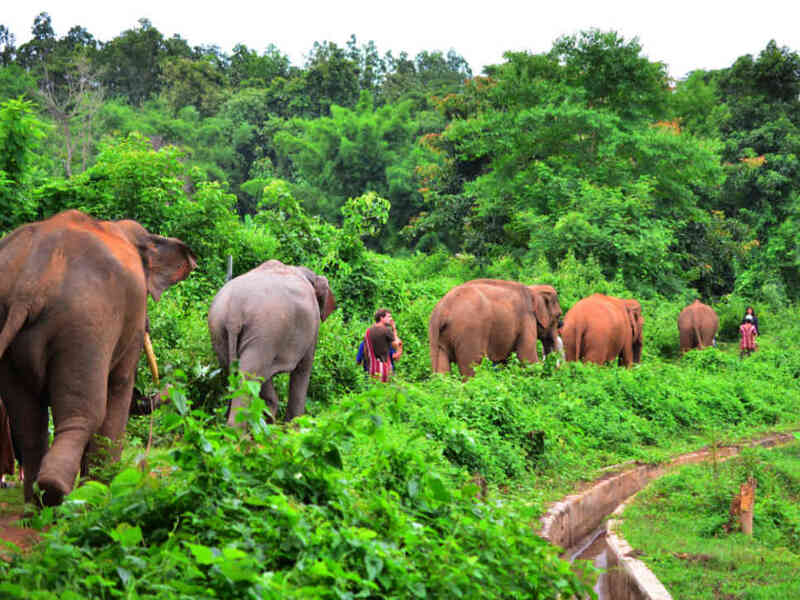 In Lampang, you visit the biggest elephant conservation center in Thailand. 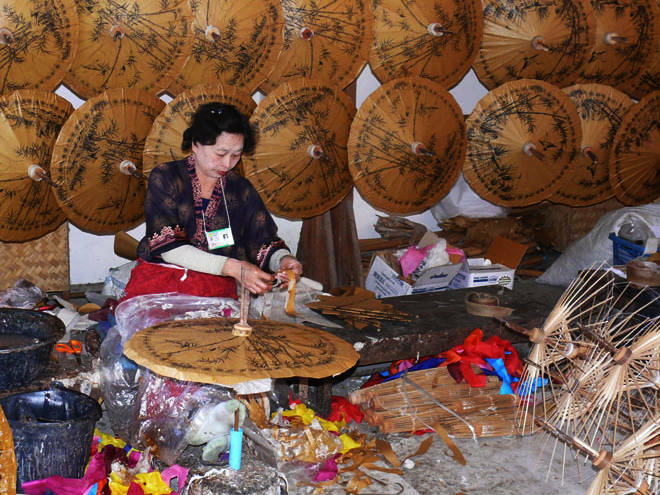 Besides attending a unique kind of “ elephant talent show” of the elephants, you will be introduced into the production of paper made of elephant dung. After that, you will visit a governmental and also a private elephant hospital. Here, where the animals are treated in different but both equally effective ways. In the afternoon you will stroll over a Itraditional Thai market, far off of normal tourist activities. At the end of the day you will get to see one of the most sacred Buddhist temples in Northern Thailand – Wat Haripunchai in Lamphun. After dinner you will again have the chance to watch a movie about elephants. 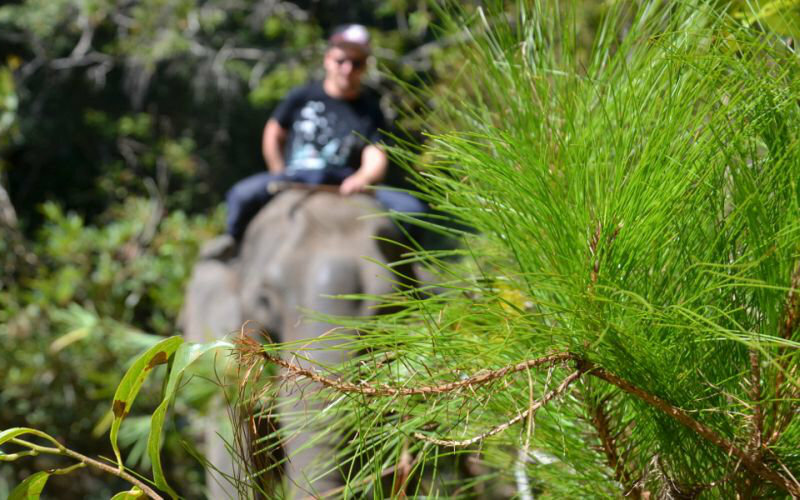 Together with the Mahouts you gather the elephants from their nighttime sleeping places in the forest. You gain further insight into basics of working the work with elephants and will enjoy taking a bath with them the elephants in the river next to our camp. With the help of your eEnglishspeaking elephant trainer you further learn to ride. 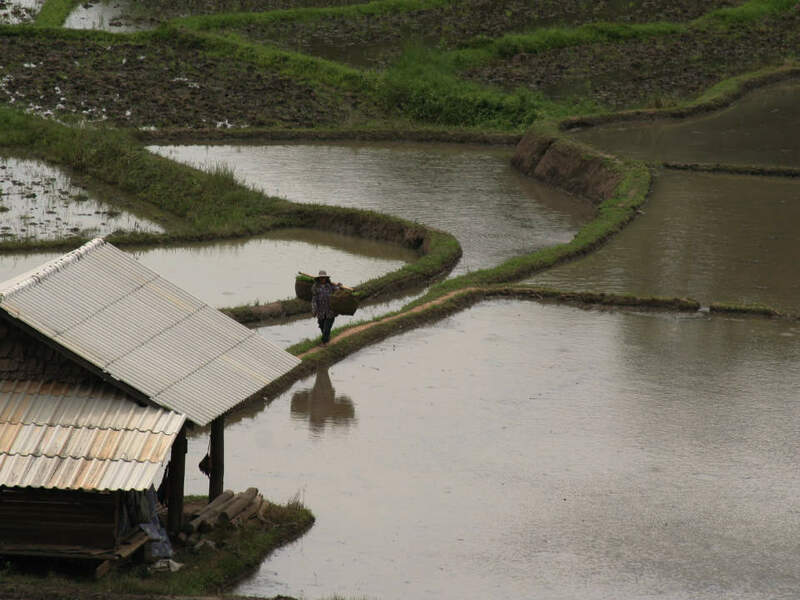 In the afternoon you will visit a royal agricultural project and a lovely waterfall in Mae Sapok. You learn about the work of elephants in the jungle. Under the guidance of your elephant trainer you ride the elephant on its neck independently using the commands you have learned. Once more you can enjoy the beautiful scenery of northern Thailand and its mountains and valleys. You will visit two very different temple complexes. 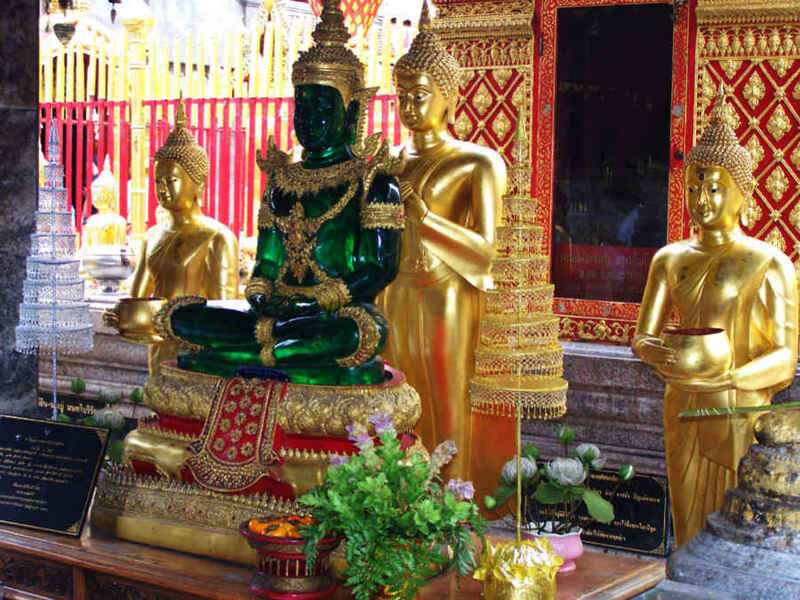 Experience the spirituality of the centuries-old mountain monastery “Wat Luang”. The monastery lies deep in the forest and is very rarely visited by tourists. Here you can quietly explore the complex and let the meditative environment work for you. 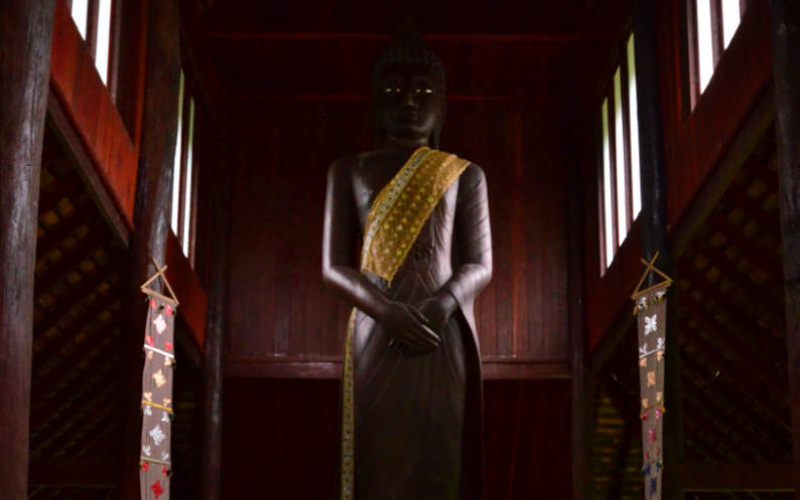 Particularly impressive are the two large wooden Buddhas, which were made from a tree trunk. After lunch, drive to the monastery “Wat Hui Thong”, built by the Karen tribe. See why the monastery is also called “Temple of the Thousand Buddhas”. The monastery is located on a mountain: Enjoy the beautiful view over the valley. 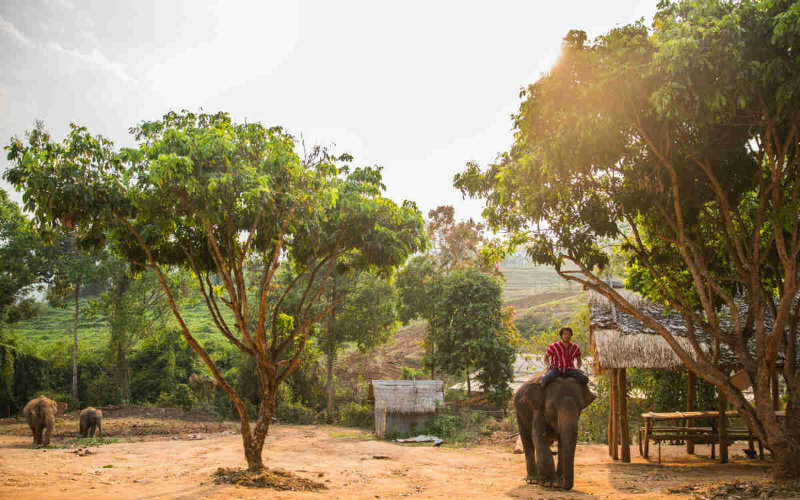 Together with your Mahouts you gather the elephants from the surroundings of the camp where they spent their nights sleeping. Our riding trips through the surroundings closer region are now stabilizing your skills and to prepare you for your final “examination”. 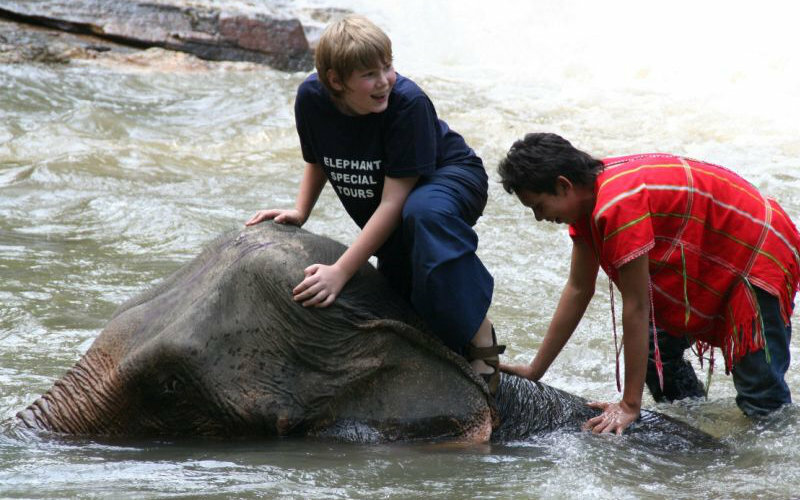 Demonstrate your skills by cleaning an elephant in the river. Practice your commands while getting on and off the elephant. You will ride along old walking treks and will have spectacular views during those rides. You also start to learn to work how to pile up tree stalks with your elephant. Of course, this training is adjusted without great physical effort to meet your needs. This tradition of work in the timber industry for centuries has been the sole source of income for the owners of the animals for centuries – we want to keep these skills alive and also want you as our guests to experience how smart those creatures are. In the evening you may watch a documentary about the work of timber elephants. Together with your Mahout you practice the elephant commands you have learned. 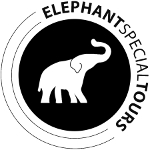 Accompanied by your elephant trainer you continue to work in the field of lodging with your elephant and learn how to outfit the elephant with the necessary equipment for pulling tree stalks. Bathing with your elephant concludes this day in the elephant camp. After lunch you experience the beauty of the local fauna while walking along the river to the valley. You will pass bamboo woods as well as giant old trees and various water falls with fantastic views. 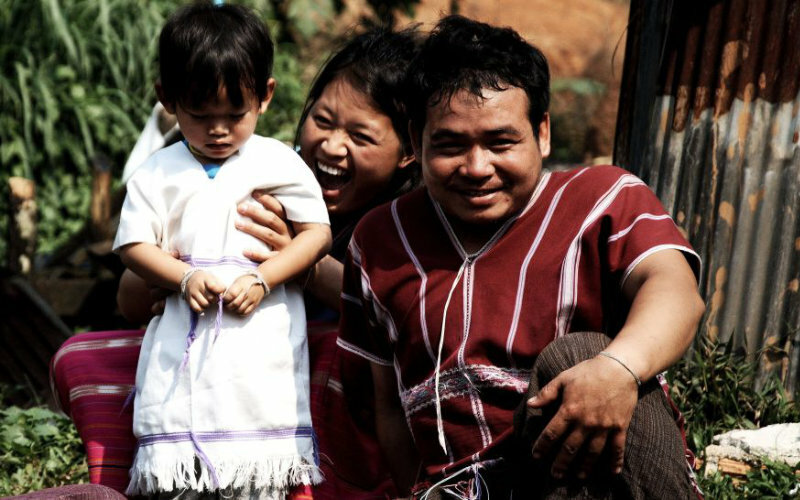 Together we experience the unique climate on the Doi Inthanon, the highest point (2565 meters) in of Thailand, where the last king of Northern Thailand is buried. We visit the evergreen forest where with its trees covered with orchids and moss. The last stop on this day is at the spectacular Wachirathan waterfall which is about 30 meters high, which where we take includes a walk down along the way as of the water falling into the valley. 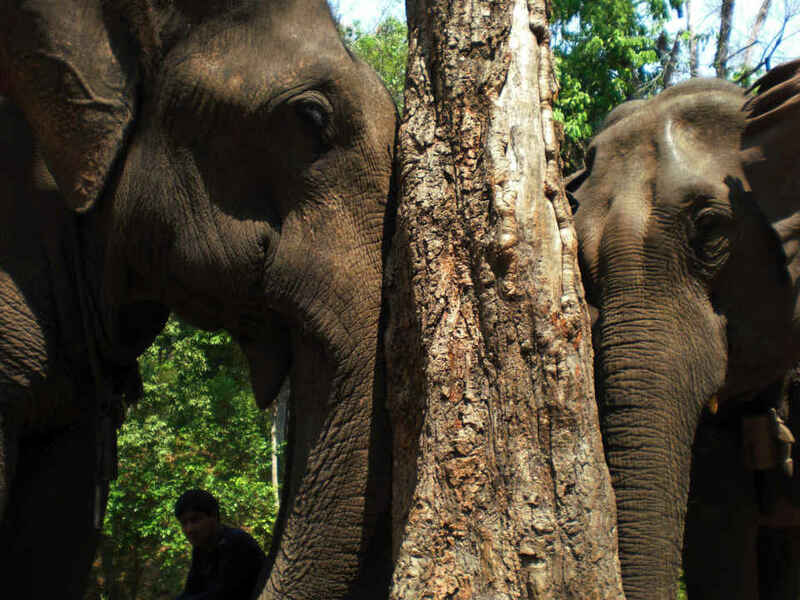 Together with the Mahouts you gather the elephants from their overnight sleeping places in the forest. You ride the elephants independently by using the commands you have learned. To clean and refresh the elephants you take a bath with them in the river. With the help of your trainer you review the techniques for putting work equipment on the elephant. Now you can independently work with the elephant. In the afternoon you have the opportunity to go on a bamboo raft which takes you on a peaceful path along local Mae Wang river. 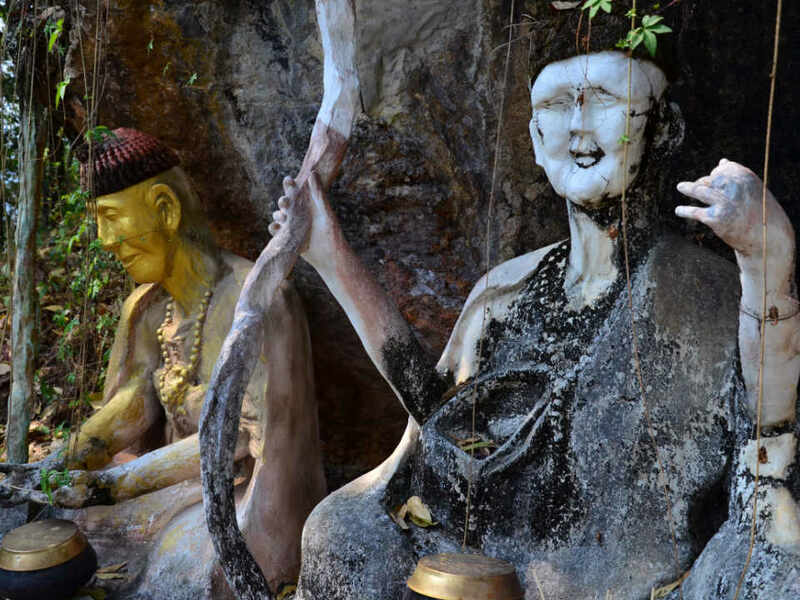 Sie fahren nach Baan Tawai, um das traditionelle Kunsthandwerkszentrum Nordthailands kennen zu lernen, wo aus Teakholz gefertigte Möbel und Gebrauchsgegenstände angeboten werden. Am Nachmittag besuchen Sie dann die Handwerksbetriebe im Dorf Bo Sang, wo traditionelle Schirme aus Papier und Seide hergestellt werden. Am Abschluss des Tages werden wir einen ganz besonderen Tempel kennen lernen, der neben wild lebenden Affen eines der spektakulärsten Höhlensysteme der Gegend bietet. 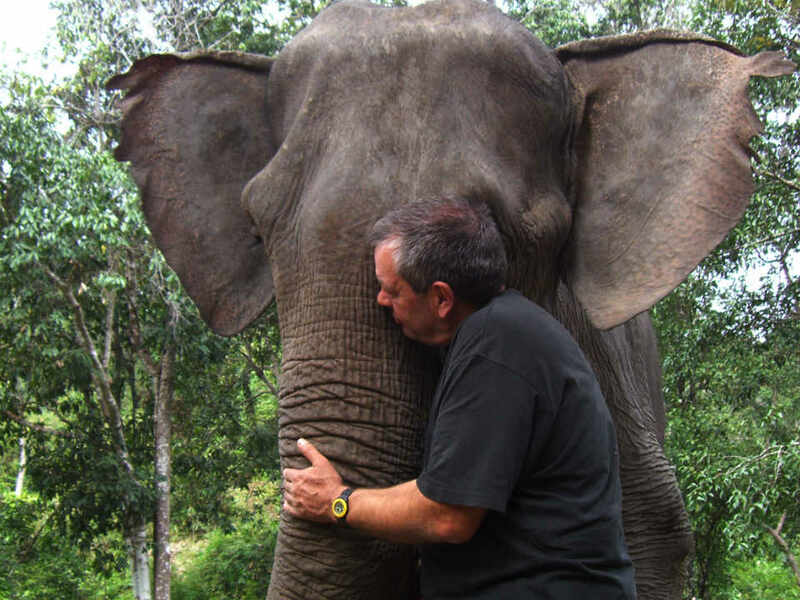 Your last day of activitiyes with your elephant in the camp: Show your trainer and your Mahout what you have learned working with the elephant. Demonstrate your talent steering the elephant. A certificate for successfully attending the “Elephant Handling Course License” will be handed out to you. 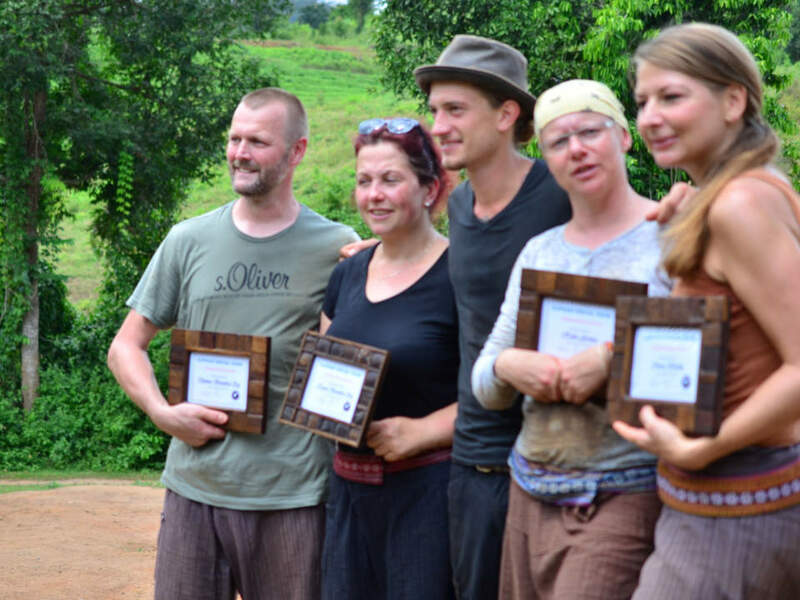 We then celebrate the happy conclusion of two wonderful weeks together with our elephant keepers and our staff. We will take you back to the airport or to your hotel in Chiang Mai.